Yeah, just got in a little art Wednesday....sorry it won't enlarge. I do not scan in my photos, it's either from my digital or phone camera. Why I cannot get a decent photo of smaller pieces with the digital photo beats me so I defer to the cellphone camera. Must get alot of art created by the end of this month for the display next month while I still complete 'maytagaramas'. VolleyGirl's team is playing post season right now. They hosted the area tournament this past Monday and won the championship! I cheered so hard that I am just now getting my voice back.....sadly my fibromyalgia didn't enjoy my cheers whatsoever. My back and knees add spice to the mix that is very unwelcome. The bleachers are not my friend. Feel like I've been beaten up and thrown in a corner. Misery may love company but I feel very alone in my pain and limitations and so often this week have wondered how much longer I can tolerate it. Wasted time on such thoughts, not a choice. Perhaps I am getting close to hitting bottom so as to force me to make some changes. Okay, enough. Each family is assigned something to bring for the team food table and I was assigned spaghetti but VG said some of the girls have been wanting my "volleyball pasta" again so I made that too. It's fun, a table full of healthy, energy packed food and snacks for the team, crockpots for the hot food. We leave early Saturday morning for the regional tournament that is over an hour away. The team is expected to do well tomorrow and compete in the substate tournament that will be next Thursday at a school practically in my backyard! If the girls come out of that, they would have made it to the "Elite Eight" that goes on to the state tournament. This is only the second time in the school's history that their volleyball team has made it this far so it is exciting. VG is still coughing and on antibiotic and so far her foot is holding together! Yea! I read something that many folks suffering from Fibromyalgia or lupus actually have a gluten allergy. I'm sorry you're in so much discompfort. At least the doctors finally agree it's not in your head! I have some of that doodling going on here too. Go VB girl. 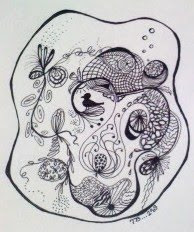 A really fine doodle...Its very sweet and cute! I feel the details would be great. Happy doodling!!! Oh, I do hope you feel better soon. It's awful to have lots to do and not feel well. Your new camera phone takes great photos. The ones of Apollo in the previous post are great, as are these ones of the food. Sounds like you are going to be very busy for the rest of the month. Stay cool. Oh my.... so you are in pain a lot, that is really awful. Well the pasta dishes look yummy! I love pasta.